The intelligencer Samuel Hartlib, who according to John Dury deserved to ‘bee sette uppe as a conduit pipe of things communicable’,1 came from mercantile stock: his father was a German merchant, and his maternal grandfather was the head of the English trading company in Elbing on the southern shores of the Baltic. After the Swedish invasion undermined Elbing’s commercial position in the late 1620s, Hartlib fled the city of his birth and war-torn central Europe to England, where eventually he settled in Westminster and lived until his death, becoming known as one of the most active reformers of the late 1630s and the ensuing civil war and republican period. The 4,708 Hartlib records featured initially in EMLO were refined and augmented by the first Cultures of Knowledge Postdoctoral Fellow Dr Leigh Penman, under the supervision of Professor Howard Hotson and Professor Mark Greengrass, and in association with the Humanities Research Institute of the University of Sheffield. The online versions of the letters from the original Hartlib Papers, to which many of these records are linked, were mounted by Michael Pidd and Jamie McLaughlin from HRIDigital at the University of Sheffield. The letters have been worked on further, particularly from the prosopographical perspective, by the second Cultures of Knowledge Hartlib Postdoctoral Fellow, Dr Robin Buning, under the supervision of Professor Howard Hotson, and an additional ten letters, not previously included as part of the initial upload to EMLO, were added to the catalogue in September 2015. Not known in his own day for published writings, Hartlib was all but forgotten by posterity until 1933 when an archive of his personal papers was rediscovered and his personal correspondence was revealed to have been enormous. From more than 25,000 folios within this archive number in excess of 4,250 letters either written to or (mostly) from some 400 correspondents or exchanged between third parties. Befitting Hartlib’s own origins, the geographical range of his correspondence network was impressive, embracing eastern and central as well as western Europe, Great Britain, Ireland, and New England. Corresponding in English, Latin, or German (and every so often in French or Dutch), the thematic scope of his letters proved no less remarkable. Baconian aspirations for the advancement of learning merged with proposals for breaking monopolies, disseminating technical discoveries, diplomatic intelligence-gathering, and employing the poor — concerns which, in the disrupted conditions of the 1640s and 50s, shaded over into utopian planning energized by millenarian expectations. Most characteristic of all was the social depth of Hartlib’s network. In sharp contrast to that of many others living in England, whose careers played out entirely within stable academic institutions, Hartlib’s circle was in constant motion, populated as it was by Protestant refugees displaced by the endemic warfare and political upheavals of the mid-seventeenth century. Today, Hartlib’s archive is recognized as one of the richest in Europe for providing an insight into the intellectual shock waves unleashed by the turbulence of the mid-seventeenth century, and Hartlib himself has taken his place at the centre of one of the great intelligencing networks of the mid-1600s. Under the auspices of Cultures of Knowledge, work is continuing on the Hartlib catalogue in the following ways: Prosopographically, Hartlib’s papers embrace a widely dispersed group of displaced intellectuals, whose movements must be tracked in order to understand the shape and genesis of the circle. Unlike the classic exemplars of the Republic of Letters, Hartlib’s circle is not organized around a small number of great scholars, philosophers, scientists, or literati communicating with one another from fixed institutional positions in major seats of learning. On the contrary, many of his correspondents are comparatively obscure, relatively few are mentioned in national biographical dictionaries, and a great many do not even feature in the local and regional references works which proliferated in central Europe from the eighteenth century onward. This obscurity is due in part to the fact that the great majority of Hartlib’s continental correspondents — between two thirds and three quarters — are itinerant: merchants, diplomats, tutors, students, projectors, exiles, and refugees, who often disappear without a trace from one national historiography as they move across national boundaries and appear simultaneously in another national scholarly tradition as if from out of a void. The ability to track their movements is essential to reconstructing the underlying shape of Hartlib’s circle and to identifying the forces that set it in motion. Geographically, these movements take place across a huge, diverse, and linguistically challenging area, ranging eastward as far as Transylvania (in modern Romania), Hungary, the Czech lands, and Poland; northward into Sweden and Denmark; westward via Germany, the Swiss Confederation, France, the Low Countries, England, Scotland, and Ireland; and across the Atlantic to the English colonies in the New World. Moreover, at the centre of this world is the most fragmented major political entity in early modern Europe — the Holy Roman Empire — offering daunting challenges and unique opportunities to the determined intellectual geographer. Only by pooling information accessible to many different experts with ready access to many different scholarly tools in many languages can anything like a collective portrait of this radically heterogeneous group be assembled. Chronologically, the movement of the figures in Hartlib’s network, and the conditions of the regions they moved across, were dictated in large part by the series of conflicts which raged across northern Europe in this period: the Northern Wars in the Baltic, the Thirty Years’ War in central Europe, and the civil wars in the British Isles. Understanding the origin and structure of various components of Hartlib’s circle requires, therefore, understanding the impact of these events on initially disparate intellectual and confessional communities. One cluster of correspondents, for instance, studied together in Reformed universities like Heidelberg and Herborn in the years before their destruction in the early 1620s, from which they were transplanted to the universities and stranger churches of the Dutch Republic and England. Another group comprised Comenius’s confessional community, the Bohemian Brethren, who were uprooted en masse after the failure of the Bohemian Revolt which touched off the Thirty Years’ War and gravitated to exile communities in Saxony, Greater Poland, and eventually Polish Prussia, where they mixed and mingled with the intelligentsia of Hartlib’s native Elbing and the neighbouring entrepôt of Danzig. In order to understand the formation and dispersal of groupings such as these, the Cultures of Knoweldge project is working towards logging into the system and mapping visually ‘event streams’ that chronicle the impact of war on individual localities. The largest part of the catalogue consists of the papers kept in Sheffield University Library. 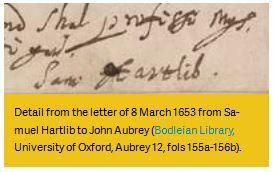 After Hartlib’s death in March 1662, his surviving letters, diaries, and other manuscripts — a fire in Hartlib’s study in early 1662 had destroyed at least part of his archive — were purchased (possibly from his son-in-law, Clodius) by William Brereton, a virtuoso who had been in contact with Hartlib since 1653. John Worthington, another friend of Hartlib, found the papers at Brereton’s house in Cheshire in 1667. He sorted through and abstracted part of the letters before Brereton, who had fallen in financial misfortune, seems to have sold them again. Worthington removed his own letters and also those of Seth Ward. Nothing is known about what happened to Hartlib’s papers from this point until 1933 when the Sheffield professor of education George Turnbull rediscovered them in a chest in the office of a London solicitor, wrapped in sixty-eight bundles, and brought them to Sheffield. Over the years, however, many letters had been dispersed, although some resurfaced in Worthington’s own manuscript collection, the Sloane collection of manuscripts in the British Library, and the Osborn Collection in Yale’s Beinecke Library.2 Since the 1947 publication of G. H. Turnbull’s Hartlib, Dury and Comenius: Gleanings from Hartlib’s Papers, Hartlib has formed the subject of numerous studies, conferences, and initiatives, including the pioneering digitization of his entire extant archive between 1988 and 2002 by the Hartlib Papers Project, led at the University of Sheffield by Mark Greengrass and Michael Leslie. Despite these successive waves of academic attention, a great deal of unfamiliar material still requires investigation. In order to navigate efficiently through this material, Howard Hotson set out in 2000 to create a fresh database of the correspondence which makes up a large proportion of the total documents in Hartlib’s archive. Assembled for his own use, and by 2009 containing 4,261 entries, this tool has proved invaluable in establishing the overall shape of Hartlib’s circle and in revealing some of the underlying structures which shaped it. Cultures of Knowledge has provided a context within which to complete, host, and disseminate this valuable tool. Currently containing 4,719 records, not only is the Hartlib catalogue the largest fresh research dataset generated during the first phase of the Cultures of Knowledge project but it is also the most prosopographically, geographically, and chronologically complex. Blekastad, Milada, ‘Peter Figulus. Letters to Samuel Hartlib 1657–58′, Lychnos (1988), pp. 201–45. Braddick, M. J. and Greengrass, Mark, eds, ‘The Letters of Sir Cheney Culpeper, 1641–1657′, in Seventeenth-Century Political and Financial Papers, Camden Miscellany, 33 / Camden Fifth Series, 7 (Cambridge, 1996), pp. 105–402. The Hartlib Papers (2 CD-ROMs, Ann Arbor, 1995; enlarged edn, Sheffield, 2002). Hitchens, W.J., Matuszewski, Adam, and Young, John, eds, The Letters of Jan Jonston to Samuel Hartlib (Warsaw: Retro-Art, 2000). Hunter, Lynette, ed., The Letters of Dorothy Moore 1612–1664. The Friendships, Marriage, and Intellectual Life of a Seventeenth-Century Woman (Aldershot: Ashgate, 2004). Malcolm, Noel, and Stedall, Jacqueline, eds, John Pell (1611–1685) and his Correspondence with Sir Charles Cavendish. The Mental World of an Early Modern Mathematician (Oxford: Oxford University Press, 2005). The Correspondence of Henry Oldenburg, ed. and tr. A. Rupert Hall and Marie Boas Hall, 13 vols (Madison: University of Wisconsin Press [vols I-IX]; London, Mansell Information/Publishing Ltd [vols X–XI]; Abingdon, Taylor & Francis [vols XII–XIII], 1965–86). Webster, Charles, Samuel Hartlib and the Advancement of Learning (Cambridge: Cambridge University Press, 1970). The Diary and Correspondence of Dr. J. Worthington, ed. J. Crossley, 3 vols (Manchester: Chetham Society Publications, 13, 36, and 114, 1847–86). Althaus, Friedrich, Samuel Hartlib Ein deutsch-englisches Charakterbild (Leipzig, 1884). Bennet, Jim, and Mandelbrote, Scott, The Garden, the Ark, the Tower, the Temple: Biblical Metaphors of Knowledge in Early Modern Europe (Oxford: Museum of the History of Science, in association with the Bodleian Library, 1998). Bepler, Jill, ‘Herzog August and the Hartlib Circle’, in Hedwig Schmidt-Glintzer, et al., eds, A Treasure House of Books: The Library of Duke August of Brunswick-Wolfenbüttel, Ausstellungskataloge der Herzog August Bibliothek, 75 (Wiesbaden: Harrassowitz, 1998), pp. 165–72. Cagnolati, Antonella, Il circolo di Hartlib: riforme educative e diffusione del sapere (Inghhilterra 1630–1660) (Bologna, 2001). Clucas, Stephen, ‘The Correspondence of a Seventeenth-Century “Chymicall Gentleman”: Sir Cheney Culpeper and the Chemical Interests of the Hartlib Circle’, Ambix, 40 (1993), pp. 147–70. — , ‘Samuel Hartlib’s Ephemerides, 1635–59, and the Pursuit of Scientific and Philosophical Manuscripts: The Religious Ethos of an Intelligencer’, The Seventeenth Century, 6 (1991), pp. 33–55. Dickson, Donald R., The Tessera of Antilia: Utopian Brotherhoods and Secret Societies in the Early Seventeenth Century, Studies in Intellectual History, 88 (Leiden: Brill, 1998). Di Palma, Vittoria, ‘Drinking Cider in Paradise: Science, Improvement, and the Politics of Fruit Trees’, in Adam Smyth, ed., A Pleasing Sinne: Drink and Conviviality in Seventeenth-Century England (Cambridge: Boydell & Brewer, 2004), pp. 161–80. Greengrass, Mark, ‘Samuel Hartlib and the Commonwealth of Learning’, in John Barnard, et al., eds, The Cambridge History of the Book in Britain, iv (Cambridge: Cambridge University Press, 2002). — , ‘Archive Refractions: Hartlib’s Papers and the Workings of an Intelligencer’, in M. Hunter, ed., Archives of the Scientific Revolution: The Formation and Exchange of Ideas in Seventeenth-Century Europe (Woodbridge: Boydell Press, 1998), pp. 35–48. — , ‘Samuel Hartlib and Scribal Publication’, Acta Comeniana, 12 (1997), pp. 47–62. — , ‘An “Intelligenger’s Workshop”: Samuel Hartlib’s Ephemerides’, Studia Comeniana et Historica, 26 (1996), pp. 48–62. — , Leslie, Michael, and Raylor, Timothy, eds, Samuel Hartlib and Universal Reformation: Studies in Intellectual Communication (Cambridge: Cambridge University Press, 1994). — , ‘Samuel Hartlib: “Intelligenceur” européen’, in La Diffusion et l’affrontement des idées en Europe 1600–1750 (Montbrison, 1994), pp. 213–34. — , ‘Samuel Hartlib and International Calvinism’, Proceedings of the Huguenot Society, 25 (1993), pp. 464–75. Inge, Keil, ‘Technology Transfer and Scientific Specialization: Johann Wiesel, Optician of Augsburg, and the Hartlib Circle’, in Greengrass, Leslie, and Raylor, eds, Samuel Hartlib and Universal Reformation, pp. 268–78. Penman, Leigh T. I., ‘Omnium Exposita Rapinæ: The Afterlives of the Papers of Samuel Hartlib’, in Book History, 19 (2016), pp. 1–65. Raylor, Timothy, ‘New Light on Milton and Hartlib’, Milton Quarterly, 27 (1993), pp. 19–31. Rozbicki, M., ‘Between East-Central Europe and Britain: Reformation and Science as Vehicles of Intellectual Communication in the mid-Seventeenth Century’, East European Quarterly, 30 (1996), pp. 401–16. Trevor-Roper, Hugh, ‘The Three Foreigners: the Philosophers of the Puritan Revolution’, in Religion, the Reformation and Social Change (3rd edn, London, 1984), pp. 237–93. Turnbull, G. H., ‘Samuel Hartlib’s Influence on the Early History of the Royal Society’, Notes and Records of the Royal Society, 10 (1953), pp. 101–30. — , ‘John Hall’s Letters to Samuel Hartlib’, Review of English Studies, new ser., 4 (1953), pp. 221–33. — , ‘Samuel Hartlib’s Connection with Sir Francis Kynaston’s “Museum Minervæ”’, Notes and Queries, 197 (1952), pp. 33–7. — , Hartlib, Dury and Comenius: Gleanings from Hartlib’s Papers (Liverpool: University Press of Liverpool, 1947). — , Samuel Hartlib: A Sketch of his Life and his Relations to J. A. Comenius (London: Oxford University Press, 1920). Webster, Charles, Utopian Planning and the Puritan Revolution: Gabriel Plattes, Samuel Hartlib, and Macaria, Research Publications, II (Oxford: Wellcome Unit for the History of Medicine, 1979). — , The Great Instauration: Science, Medicine and Reform, 1626–1660 (London: Duckworth, 1975). — , The Intellectual Revolution of the Seventeenth Century (London and Boston: Routledge & Kegan Paul, 1974). — , ‘Samuel Hartlib and the Great Reformation’, Acta Comeniana, 26 (1970), pp. 147–64. Wilkinson, R. S., ‘The Hartlib Papers and Seventeenth-Century Chemistry’, Ambix, 15 (1968), pp. 54–69; and 17 (1970), pp. 85–110. Young, J. T., Faith, Medical Alchemy and Natural Philosophy: Johann Moriaen, Reformed Intelligencer, and the Hartlib Circle (Aldershot: Ashgate, 1998). 1 Turnbull, G.H., Samuel Hartlib: A Sketch of his Life and his Relations to J. A. Comenius (Oxford: Oxford University Press and London: Humphrey Milford, 1920), pp.74–9. 2 Greengrass, Mark, Leslie, Michael, and Raylor, Timothy, eds, Samuel Hartlib and Universal Reformation: Studies in Intellectual Communication (Cambridge: Cambridge University Press, 1994), pp. 4–8; Richard Yeo, Notebooks, English Virtuosi, and Early Modern Science (Chicago: University of Chicago Press, 2014), p. 102.